Key Takeaway: The Islamic State of Iraq and al Sham (ISIS) is reconstituting a capable insurgent force in Iraq and Syria despite efforts to prevent its recovery by the U.S. Anti-ISIS Coalition. The U.S. Department of Defense stated in August 2018 that ISIS retains nearly 30,000 fighters across Iraq and Syria and is “more capable” than Al-Qaeda in Iraq - ISIS’s predecessor - at its peak in 2006 - 2007. ISIS is waging an effective campaign to reestablish durable support zones while raising funds and rebuilding command-and-control over its remnant forces. On its current trajectory, ISIS could regain sufficient strength to mount a renewed insurgency that once again threatens to overmatch local security forces in both Iraq and Syria. 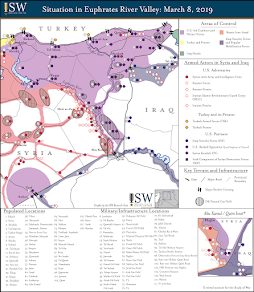 The Institute for the Study of War (ISW) is issuing a map update depicting ISIS’s current operating areas based on an analysis of its activity from January 1, 2018 to October 1, 2018. The U.S. Anti-ISIS Campaign has not eliminated the global threat posed by ISIS despite largely accomplishing its stated objectives in Iraq and Syria. The campaign aimed to destroy ISIS’s physical caliphate and “drive down [its] capability” to the point where local forces could maintain security with limited international support. In Iraq, the U.S. Anti-ISIS Coalition accomplished this mission by April 2018 after finishing the last urban clearing operations in Anbar Province in Western Iraq. The Coalition scaled down its operations to a Building Partner Capacity (BPC) effort aimed at enabling Iraqis to “independently manage” a continued insurgency by ISIS. In Syria, the U.S. and its local partner forces are now attacking a final ISIS territorial stronghold near the Syrian-Iraqi border. ISIS has nonetheless already restructured its operations to return to a regional insurgency. The Pentagon stated in August 2018 that ISIS retains nearly 30,000 fighters across Iraq and Syria and is “more capable” than Al-Qaeda in Iraq - ISIS’s predecessor - at its peak in 2006 - 2007. ISIS is now waging an effective campaign to reestablish durable support zones while raising funds and rebuilding command-and-control over its remnant forces. On its current trajectory, ISIS could regain sufficient strength to mount a renewed insurgency that once again threatens to overmatch local security forces in both Iraq and Syria despite support from the Coalition. ISIS has reportedly established a network of front companies - including car dealerships, electronic shops, pharmacies, and currency exchanges - to launder money in Iraq. ISIS can only wage an effective insurgency if it maintains command-and-control over its estimated tens of thousands of remaining fighters. The U.S. Anti-ISIS Campaign has forced some of ISIS’s cells to go to ground and it is unclear how many fighters its senior leaders can directly command. ISIS Emir Abu Bakr al-Baghdadi released an audio message on August 22 calling for his followers to “wage attack after attack” and “unite and organize” against their opponents. ISIS similarly appealed in publications in March - April 2018 for the activation of sleeper cells. These messages suggest that ISIS deliberately embedded operatives to conduct future attacks in recaptured areas across Iraq and Syria. The public orders nonetheless signal that ISIS may lack control mechanisms to issue direct commands to its forces. 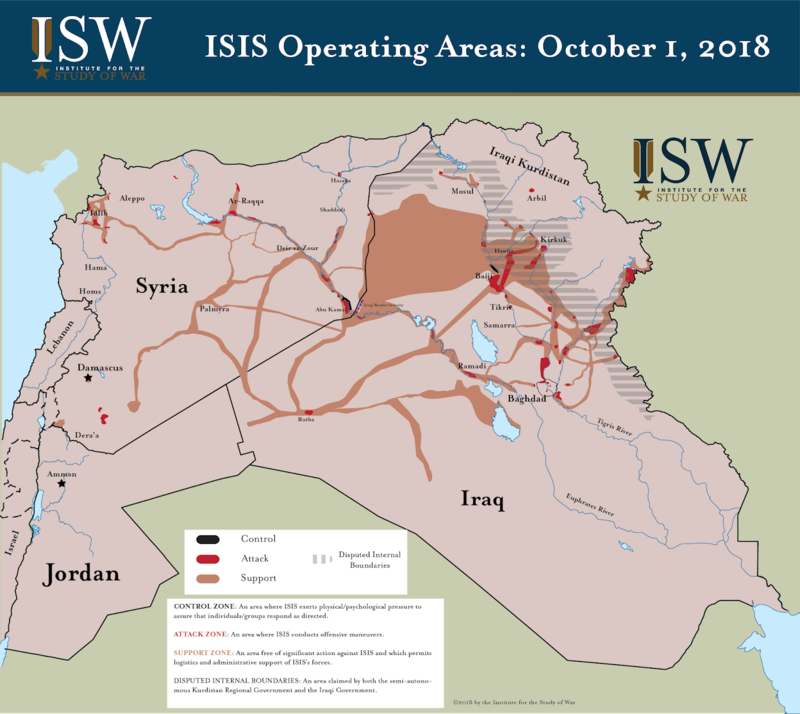 ISW has observed at least four indicators that ISIS is reconstituting an operational-level command structure in Iraq and Syria as of October 1. ISIS is waging an effective campaign to reestablish durable support zones across Iraq and deny the rehabilitation of communities liberated by the U.S. Anti-ISIS Campaign. ISIS retains a small control zone where it continues to govern a local population north of Baiji in Northern Iraq. It also retains established support zones in areas south of Kirkuk City including Daquq, Hawija, Riyadh, and Rashad Districts as well as rural areas around Lake Hamrin in the Diyala River Valley. ISIS possesses the ability to move freely across this terrain at night and is actively waging attacks to expand its freedom of movement during the day. Its activities have thus far been limited to small arms attacks, targeted assassinations, and suicide vests (SVESTs). ISIS is steadily scaling up the rate of these attacks, conducting as many as four assassinations per week across Northern and Central Iraq. This violence has expelled civilians from small villages in Diyala and Kirkuk Provinces. ISIS also retains a durable support zone in the Hamrin Mountains, where it appears to base some of its leadership. Iraqi Security Forces (ISF) regularly claim to kill senior militants during clearing operations in the area. In Baghdad, ISIS’s attack pattern indicates that it is likely reconstituting support and logistical networks throughout the Baghdad Belts, replicating its safe havens in 2006 - 2007. ISIS has not yet returned to the systematic use of vehicle-borne IEDs (VBIEDs), which were a hallmark of its resurgence in 2011 - 2013. ISIS may cross this threshold soon. The Iraqi Ministry of Interior claimed to disrupt an ISIS VBIED cell north of Baghdad on September 6. ISIS is also reconstituting as an insurgent force across Syria. ISIS has lost all its territorial control in Syria except a twenty-kilometer-long stretch of terrain along the Euphrates River in Eastern Syria near the Syrian-Iraqi border. The area is currently under attack by the U.S. Anti-ISIS Coalition. ISIS is nonetheless reconstituting in areas nominally under the control of Syrian President Bashar al-Assad. ISIS negotiated evacuation deals from Damascus and the Golan Heights to relocate its forces to the Syrian Desert east of Damascus in May - July 2018. 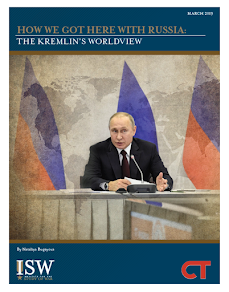 ISIS has exploited its underground tunnel networks in order to regroup and launch local counter-attacks in this area against both the Russo-Iranian Coalition and the U.S. Anti-ISIS Coalition. ISIS is also infiltrating Al-Qaeda’s areas of operations in Northern Syria in order to gain access to logistics routes through Turkey. It may also intend to tap into flows of Al-Qaeda-aligned foreign fighters. ISIS has also demonstrated that it retains the ability to mount attacks in areas held by the U.S. Anti-ISIS Coalition and Syrian Democratic Forces (SDF) including Ar-Raqqa City, Hasaka City, and Qamishli. ISIS is likely regenerating support networks across its former territorial holdings in Northern and Eastern Syria. The U.S. risks finding its options against ISIS in Iraq further constrained by the outcome of the ongoing government formation process in Baghdad. Iran is making a concerted effort to shape a Government of Iraq that is hostile to the U.S. and could demand a full withdraw of the U.S. Anti-ISIS Coalition. The U.S. is meanwhile using its economic leverage - and threats to revoke bilateral military support - in order to block powerful proxies of Iran from occupying key positions in the Government of Iraq. The outcome of this showdown remains unclear but it could lead to a violent confrontation between rival powerbrokers that would provide new openings for ISIS. The U.S. and its allies must take action to set the political conditions necessary to sustain a long-term campaign against ISIS in Iraq and Syria. ISIS otherwise threatens to return yet again in a form even more dangerous and more capable than its rise to global prominence in 2014. [“Successive Clearing Operations in Five Provinces After Monitoring the Movements of ISIS,”] Al-Mada Press, September 26, 2018, http://almadapaper(.)net/Details/213471/%D8%B9%D9%85%D9%84%D9%8A%D9%91%D8%A7%D8%AA-%D8%AA%D9%85%D8%B4%D9%8A%D8%B7-%D9%85%D8%AA%D9%84%D8%A7%D8%AD%D9%82%D8%A9-%D9%81%D9%8A-5-%D9%85%D8%AD%D8%A7%D9%81%D8%B8%D8%A7%D8%AA-%D8%A8%D8%B9%D8%AF-%D8%B1%D8%B5%D8%AF-%D8%AA%D8%AD%D8%B1%D9%91%D9%83%D8%A7%D8%AA-%D9%84%D8%AF%D8%A7%D8%B9%D8%B4. [“Source Reveals the Displacement of Families from South of Kirkuk,”] Sot al-Iraq, June 20, 2018, https://www.sotaliraq(. )com/2018/06/20/%D9%85%D8%B5%D8%AF%D8%B1-%D9%8A%D9%83%D8%B4%D9%81-%D8%B9%D9%86-%D9%86%D8%B2%D9%88%D8%AD-%D8%B9%D9%88%D8%A7%D8%A6%D9%84-%D9%85%D9%86-%D8%AC%D9%86%D9%88%D8%A8-%D9%83%D8%B1%D9%83%D9%88%D9%83/; [“Kurdish Lawmaker: 200 Kurdish Families Displaced from Villages of Daquq District Because of ISIS,”] Sumaria, June 26, 2018, https://www.alsumaria(.)tv/news/240307/%D9%86%D8%A7%D8%A6%D8%A8-%D9%83%D8%B1%D8%AF%D9%8A-%D9%86%D8%B2%D9%88%D8%AD-%D8%B9%D8%A7%D8%A6%D9%84%D8%A9-%D9%83%D8%B1%D8%AF%D9%8A%D8%A9-%D9%85%D9%86-%D9%82%D8%B1%D9%89-%D9%82%D8%B6%D8%A7%D8%A1-%D8%AF%D8%A7%D9%82%D9%88%D9%82-%D8%A8%D8%B3%D8%A8%D8%A8/ar. [“Popular Mobilization Announces the Killing of an ISIS Leader Northeast of Diyala,”] Sumaria, June 15, 2018, https://www.alsumaria(. )tv/news/239447/%D8%A7%D9%84%D8%AD%D8%B4%D8%AF-%D8%A7%D9%84%D8%B4%D8%B9%D8%A8%D9%8A-%D9%8A%D8%B9%D9%84%D9%86-%D9%85%D9%82%D8%AA%D9%84-%D9%82%D9%8A%D8%A7%D8%AF%D9%8A-%D8%A8%D9%80%D8%AF%D8%A7%D8%B9%D8%B4-%D8%B4%D9%85%D8%A7%D9%84-%D8%B4%D8%B1%D9%82%D9%8A-%D8%AF%D9%8A%D8%A7%D9%84/ar; [“Death of a Senior Commander for ISIS in Clashes with Iraqi Forces in the North of the Country,”] The New Arab, June 26, 2018, https://www.alaraby.co(.)uk/politics/2018/6/26/%D9%85%D9%82%D8%AA%D9%84-%D9%82%D9%8A%D8%A7%D8%AF%D9%8A-%D8%A8%D8%A7%D8%B1%D8%B2-%D8%A8%D9%80-%D8%AF%D8%A7%D8%B9%D8%B4-%D9%81%D9%8A-%D9%85%D9%88%D8%A7%D8%AC%D9%87%D8%A7%D8%AA-%D9%85%D8%B9-%D8%A7%D9%84%D9%82%D9%88%D8%A7%D8%AA-%D8%A7%D9%84%D8%B9%D8%B1%D8%A7%D9%82%D9%8A%D8%A9. [“Source: Interior Intelligence Thwarted Plan to Revive ‘Wilayat Baghdad’ of ISIS,”] Al-Ghad Press, September 6, 2018, https://www.alghadpress(.)com/news/%D8%A3%D8%AE%D8%A8%D8%A7%D8%B1-%D8%A7%D9%84%D8%B9%D8%B1%D8%A7%D9%82/173347/%D9%85%D8%B5%D8%AF%D8%B1-%D8%A7%D8%B3%D8%AA%D8%AE%D8%A8%D8%A7%D8%B1%D8%A7%D8%AA-%D8%A7%D9%84%D8%AF%D8%A7%D8%AE%D9%84%D9%8A%D8%A9-%D8%A3%D8%AD%D8%A8%D8%B7%D8%AA-%D9%85%D8%AE%D8%B7%D8%B7%D8%A7-%D9%84%D8%A5%D8%B9%D8%A7%D8%AF%D8%A9-%D8%A5%D8%AD%D9%8A%D8%A7%D8%A1-%D9%88. [“ISIS Fails in Declaration of ‘Wilayat Halabja’ and Reveals Its Hideouts in Sulaymaniyah,”] Sot al-Iraq, February 5, 2018, https://www.sotaliraq(.)com/2018/02/05/%D8%AF%D8%A7%D8%B9%D8%B4-%D9%8A%D9%81%D8%B4%D9%84-%D8%A8%D8%A5%D8%B9%D9%84%D8%A7%D9%86-%D9%88%D9%84%D8%A7%D9%8A%D8%A9-%D8%AD%D9%84%D8%A8%D8%AC%D8%A9-%D9%88%D9%8A%D9%83%D8%B4%D9%81-%D9%85%D8%AE/. [“Asayish Official: ISIS Militants That Clashed with Iranian Forces Entered Iran Through Borders of Kurdistan,”] Sumaria, January 27, 2018, https://www.alsumaria(. )tv/news/228070/%D9%85%D8%B3%D8%A4%D9%88%D9%84-%D8%A8%D8%A7%D9%84%D8%A7%D8%B3%D8%A7%D9%8A%D8%B4-%D9%85%D8%B3%D9%84%D8%AD%D9%88-%D8%AF%D8%A7%D8%B9%D8%B4-%D8%A7%D9%84%D9%85%D8%B4%D8%AA%D8%A8%D9%83%D9%8A%D9%86-%D9%85%D8%B9-%D8%A7%D9%84%D9%82%D9%88%D8%A7%D8%AA-%D8%A7%D9%84%D8%A7%D9%8A/ar; [“Sulaymaniyah...The Arrest of Two Groups of Terrorists Before the Implementation of Their Plans in the Kurdistan Region,”] Rudaw, January 8, 2018, http://www.rudaw(.)net/arabic/kurdistan/080120186. [“Basra Police to Mirbad: Incoming Forces Will Protect Facilities and Their Movement Under the Order of Abadi Exclusively,”] Mirbad, July 14, 2018, http://www.almirbad(.)com/news/view.aspx?cdate=14072018&id=41fdb375-61bd-4121-8283-81cb054e4446. [“Emergency Response Announces the Deployment of Their Formations in Basra to Protect Vital Centers,”] Mirbad, September 14, 2018, http://www.almirbad(. )com/news/view.aspx?cdate=14092018&id=9b320244-1d0d-4ff7-805c-a7b2b2e50d94.